Amanda Parkes is bridging the worlds of tech and fashion to make sure next-gen wearables look less like watches and more like scarves. A milky white, stiletto-shaped mold is sitting on Amanda Parkes’s desk. It’s the beginnings of a project to restructure high heels to make the notoriously painful shoes more comfortable. “If men had to wear high heels, this would have been addressed 100 years ago,” says Parkes, the design director for the product, which comes by way of Thesis, a new shoe company founded by a former SpaceX employee. Next to that is half of a bra, a model for a new shape of memory polymer insert. When finished, instead of using an underwire, the garment will respond to body heat, molding to a woman’s shape. “It will be much more comfortable,” says Parkes. Those are just two of the projects Parkes has taken on as a fashion-tech consultant with her company Skinteractive Studios, which she founded in 2009 to help develop wearables. A product engineer by training, Parkes engages with both the conceptual and practical. She worked with a French contemporary dance company to create a performance in which the dancers power the show with their movements. She’s also advising Ringly, a connected ring that looks more like a piece of jewelry than a gadget. Tellingly, what you don’t see in her portfolio is a smartwatch. “If you look out there, it’s basically Misfit wearables, the Apple Watch, the Fitbit–these are companies that are basically making gadgets that are attached to your body. That’s not innovation, really,” she says. Indeed, the current wearable landscape includes gadgets both ugly and useless. Even the best smart watches and bracelets only have so much potential: A wrist can only tell a gadget so much, and there is only so much room on our arms for gadgets. And, as far as market potential goes, it’s the right place to be. Recent projections from Gartner predict that “smart garments”–currently just a blip in the wearables market–will outsell “smart wristbands” and become a regular part of our wardrobes. By 2016, smart garments are expected to make up 26 million of the 91 million units shipped for wearables, vs. 19 million for wristbands. The projects Parkes is working on now may very well be what you are wearing in five years. Parkes says she has loved fashion since a young age. When she says fashion, though, she doesn’t mean devouring Vogue and wearing the latest trends. She dresses more like a design-minded person than a fashionista, pairing geometric jewelry with structural high-heeled booties. “She means it at a much more intellectual, philosophical, deep level than most people think about it,” Dolly Singh, the founder of Thesis, says. For Parkes, what we wear reflects culture and personal expression. At her Redondo Beach, California, high school, she gravitated toward math and science as much as art. At Stanford, she discovered she could combine those seemingly disparate interests as a product design engineer, getting a BS and BA in mechanical engineering and art history, respectively. After school, she got a Guggenheim fellowship, worked as a curator in various museums, and taught herself to code. In 2002, she landed at MIT’s Tangible Media Group, where she was first introduced to fashion tech. “I was seeing really kind of disturbing examples of what people thought were wearables,” she recalls. The space at the time lauded creations like Steve Mann’s cyborg face-computer–nothing actually wearable. I was seeing really kind of disturbing examples of what people thought were wearables. She stayed on at MIT for a PhD, focusing on kinetic interaction design–the mechanics of how to design objects with movement in mind. Her thesis included various projects, including Bosu, a soft material that could remember a specific shape when molded. Despite a continued interest in fashion tech, after getting her PhD, Parkes went to work for a biotech startup she cofounded called Bodega Algae. The company’s goal was to scale up algae production to use as biofuel. Too early to the space, Bodega Algae shut down in 2011. From that point forward, Parkes focused entirely on product design. In her office, Parkes lifts up a Tupperware container filled with what looks like one of yellow blobs teachers use in health class to demonstrate five pounds of congealed fat. “This is the waste product of kombucha” she explains. It feels like cold, raw chicken. “It turns into this bio-leather. It’s very tough. 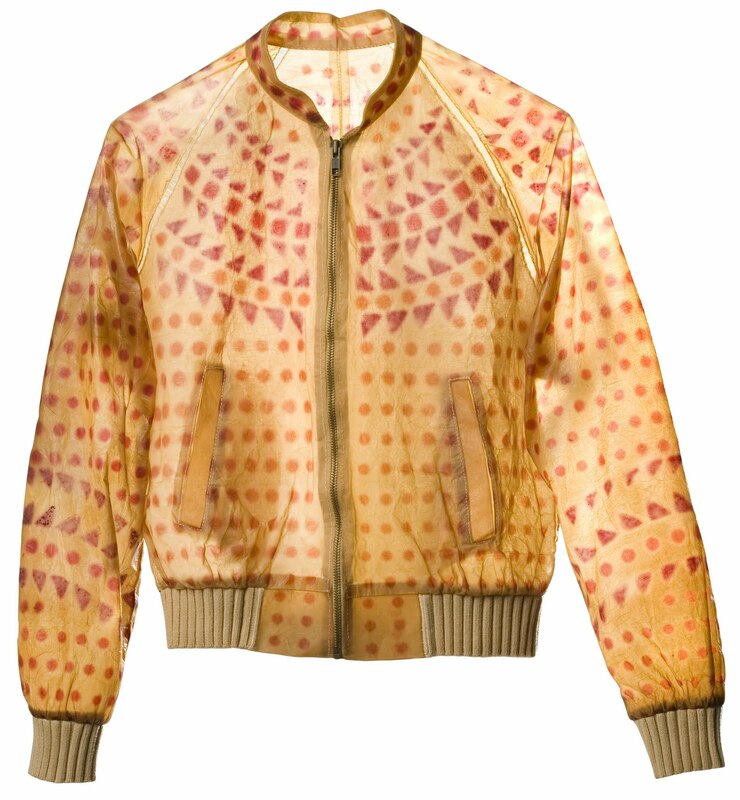 You can dye it, you can sew it.” The faux-leather jackets Biocouture makes using the after-parts of the hippy drink look pretty badass. There is one major problem: The material absorbs water when it gets wet, a non-starter for a jacket replacement. Not for Parkes. She knows a company making a non-toxic hydrophobic coating process, and plans on bringing the two innovations together at Manufacture New York, a fashion incubator and manufacturing hub opening up in Sunset Park next year, where Parkes is the CTO. Parkes will fold her gigs at Skinteractive Studios into the tech R&D lab inside the space. Modeled after the MIT Media Lab, Manufacture New York will bring together manufacturers, fashion designers, technologists, and scientists all in one Brooklyn warehouse with the hope of promoting the cross-fertilization of ideas. It’s the ‘Intel inside’ model; it’s the secret million-dollar product that everyone else is using. Having straddled the lines between fashion and tech for over a decade, Parkes’s biggest asset is acting as a translator between the two worlds. “There are very few people who either want to bridge this space or who effectively do bridge this space,” says Daniel Steingart, a professor at Princeton working with Parkes to create a battery that looks indistinguishable from a shirt. Thesis brought on Parkes specifically to get its space engineers to talk to its shoe designers. The divide she’s bridging is great. Advances that will truly bring fashion and tech together, like connectors between any kind of wire and any kind of fabric, don’t yet exist. But it’s necessary for technology to weave its way into our clothes. “It’s the ‘Intel inside’ model; it’s the secret million-dollar product that everyone else is using,” Parkes says. And that’s just one of many potential simple building blocks that will open up entire new industries. Most successful technology and fashion companies have very little in common. Take Apple. It wins the smartphone market by making one very beautiful phone that every single person wants. That tactic aligns with its economies of scale and manufacturing processes. Apple spends a lump sum for an injection mold that it uses millions of times. Customization doesn’t fit into that operation. I don’t think the point is to have a shirt that you play Angry Birds on. Fashion, on the other hand, sells individuality. Sure, Gap makes a lot of basic white button-down shirts. But not everyone shops at Gap, and even the people who do shop at Gap don’t all buy that one shirt. Trendy fast fashion retailers, like H&M and Forever 21, operate and succeed because of constant changing variety. Humans don’t want to look exactly the same. In Parkes’s view, tech companies that try to win the entire wearables market will fail. Apple might dominate the sport-watch category, but products like Withings Activité, a fitness tracker disguised as a high-end Swiss watch, for instance, will appeal to a different set of people. Wearables have also failed to capture a broad audience because of a lack of obvious utility. Parkes and others in the field say they can’t predict the applications of truly wearable wearables, but it’s not impossible to imagine how advances like the shirt battery could lead to something more mind blowing than a watch-sized computer. “I don’t think the point is to have a shirt that you play Angry Birds on,” says Steingart, who has done battery research for nearly 10 years, creating some of the first bendable and stretchable batteries. While he has given batteries fabric-like qualities, he has never made one that looks like a piece of cloth, the next step in his research. Steingart imagines a world in which designers could dye a battery into their fabrics. There is a limitation to the number of hard things you’re going to wear on your body; it’s basically jewelry. But if you have a softer system, like a scarf, there are more opportunities. That would be insanely cool, but what are the applications of something like that? A shirt has more surface area than a phone, so it can theoretically have higher capacity to hold a charge. On a basic level, people could use their clothing as a battery, which would be convenient. But things start to get really interesting when those batteries power a connected shirt. A garment that touches many major organs can know more than a wrist dongle. A smart shirt or scarf or pocket square can also take advantage of motion control. “Right now it’s very much like this,” Parkes said, grabbing her iPhone to mimic the concentration required of a two-handed text message response. “There’s always a kind of removal, it has nothing to do with your body,” she says, before getting distracted by messages she had missed. “Um, yeah, see,” she said, unable to construct a full sentence while answering her missed texts. This post has been updated to clarify Parkes relationship with Google.